Projecting and developing the new mobile experience for iOS and Android. 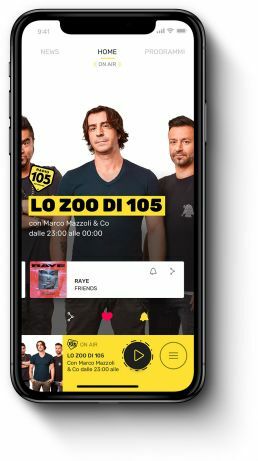 With almost 5 millions daily listeners, Radio 105 is one of the radios in Italy with the largest audience. Planning their new app has been the opportunity for us to work with a unique app, used everyday by tens of thousands of users. The initial briefing oriented the team towards the design of an interface that had to be highly distinctive, intuitive and that took inspiration from the current design trends. 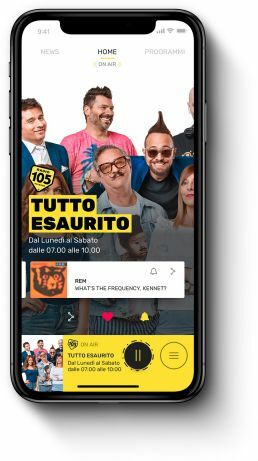 The strong identity of Radio 105, its history, the freshness and irreverence of its shows and its target audience were the pillars upon which the guidelines for the reprojecting of the app were defined. 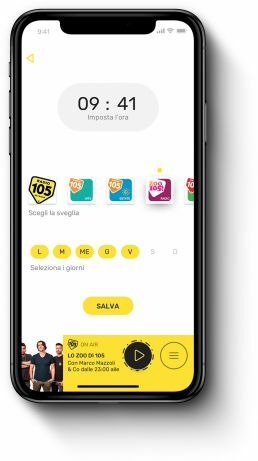 The study of the already existing app (flows, contents, design) has been done in parallel with the benchmarking activity, conducted together with the client, and the user sentiment analysis on the respective stores. Once identified the weaknesses on which to work on the backend side, the “must-have” functions for the first and following versions of the app were shared. The development was then characterized by regular cycles of validations at every phase of the process. This approach allows a continuous involvement of the client, the punctual alignment on the status and the optimization of the production time. 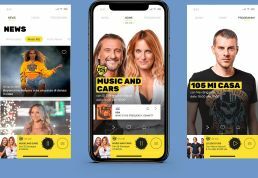 The Radio 105 app is part of the daily life of its listeners, and it articulates the different moments of the day: when they wake up, during their movements (work, leisure), during their breaks or duing their spare time. 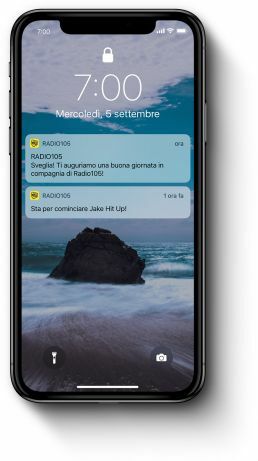 The large diffusion of smartphones with large screens was crucial in deciding to put the calls to action below the line of the viewport, in particular locating the burger menu and the play/pause button. The goal was to make easily accessible every function even when using the app only with the thumb. We wanted to make it a pleasent experience to re-open the app every time. 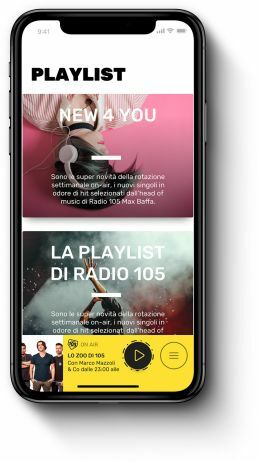 Also, we wanted access to the live shows not to be the only function in evidence, but to let the homepage offer a series of always new contents that were easily accessible even whilst listening. The journey that took to the graphic definitions of the app began with the design of the data. Through a scheme, the UX flow and the relative organizations of all the sections within a unique menu were introduced. We identified all the content representation models to create a design system that was always coherent and that made the user experience immediately clear and simple thanks to defined patterns. From the beginning, our proposition for the homepage included a subdivision through tabs to include multiple sections. In the default central position is the live of the current show. Scrolling right there is the show plan of the day. Scrolling left the are the categorized news following the order dictated by the backend of the website. The wireframing and UI were both made in the prototyping phase is such a way so that they give immediately the validated look and feel to the client. The instrument is always essential to share comments and impressions and to optimize any usability aspects. The choices that lead to the final interface, respect the official brand guidelines and they largely use fullscreen images to make every piece of content pleasant and characteristic at first sight. The use of text and labels was made to the bare minimum to maintain overall cleanness and clarity. 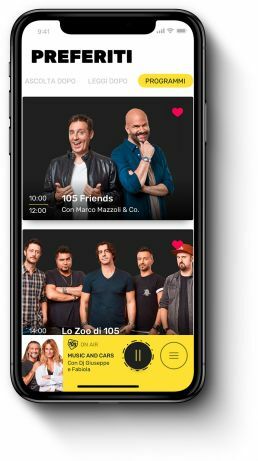 We used photographic shots of every host realized by Radio 105 to customize the cover if every show, in order to avoid using lists were not necessary and to make the interface very visible and eye-pleasing on large and small screens. In order to adapt the horizontal pictures, we thought of utilizing the gyroscope present in iOS and Android devices to make every cover dynamic and playful. Through a notification system, we thought of sending an alert when the client’s favorite brands or program are live. The possibility of setting an alarm, with the ability to choose the program to play at the established time. It is possible to save in the favorites section: shows, news, podcasts and re-runs.